Last Sunday I had the pleasure of having Chip and Chris over for a game of I Ain’t Been Shot Mum. After looking at various options for scenarios I figured that the easiest way was simply to translate the starter scenario in the rulebook to the Eastern Front. So it changed from a fictional encounter outside Caen, to a fictional encounter during Operation Kutusov: an infantry company from the Soviet 63rd Army (my figures, used by Chris) attacks a company from the German 262nd Infantry Division (Chip’s SS). I replaced the three pre-game stonks in the starter scenario with two Soviet style Super Stonks, but that was a little more awesome than necessary, one is quite enough. Chip decided to deploy all his troops early so they could be rallied, as Chris was making pretty good progress down the table with his Blinds. Chip’s Germans deployed. We had just enough shock markers. Chris’s Soviets advance on the German company, reeling from the pre-game bombardment. Chris advanced into the orchard, closing on Chip’s 2nd (right) platoon. 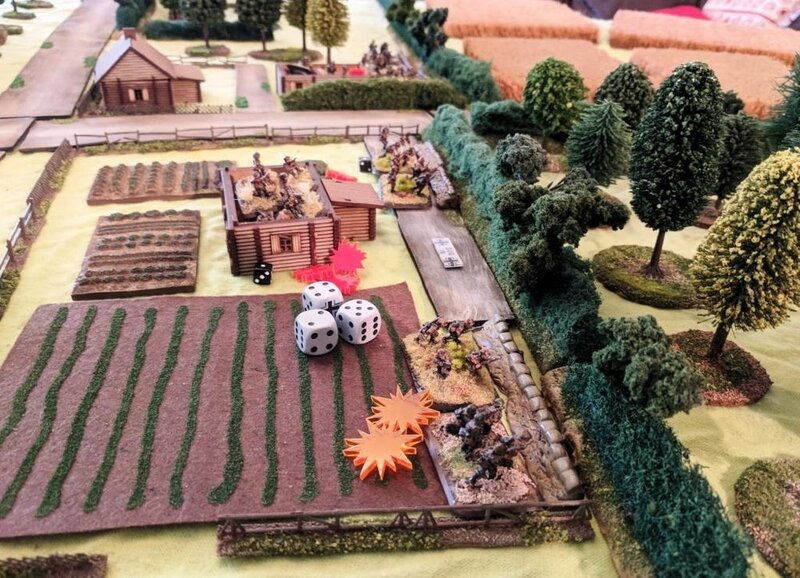 Chris races into the orchard, hoping to catch the Germans while they still have a lot of shock. 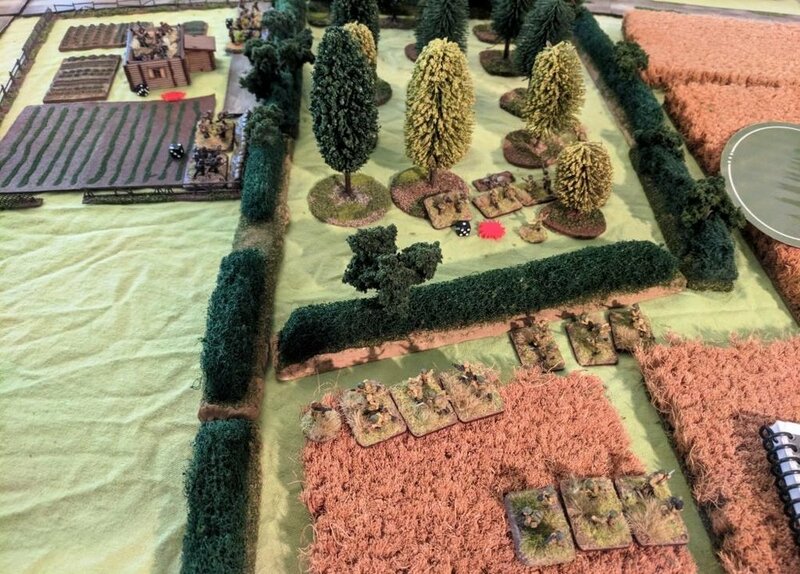 Chip promptly had a run of good luck on the cards, his MGs, in houses behind the front line trenches, spotted the advancing Soviets and let rip with both standard and bonus activations, decimating the Soviet platoon in the orchard. 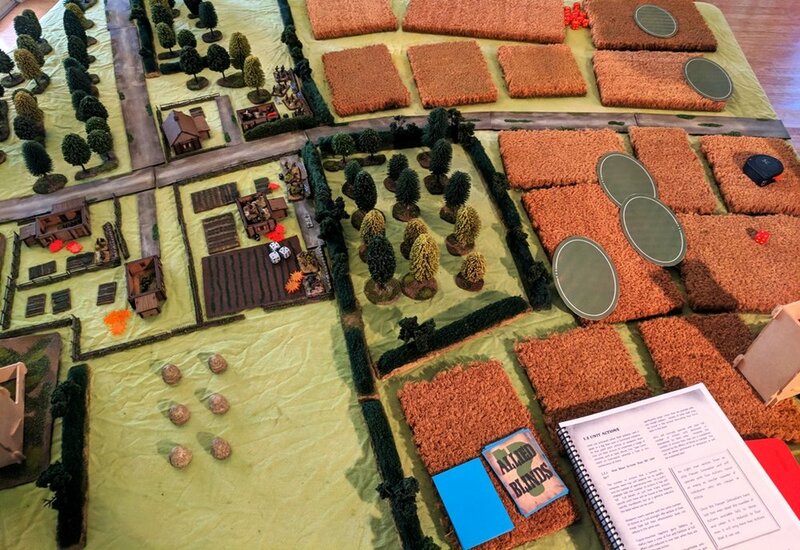 Chris began pushing his Blinds toward the German left flank. Chris’s 2nd platoon heads past the half of his 3rd platoon that remained. They are ready for their closeup. These were closely followed by his support platoon, which soon began chewing up the German platoon and the MG that had been doing so much damage. Chip’s 1st platoon finally realised that the movement in the wheat to their front was just a patrol, so they began displacing to assist their comrades, and none too soon, as the German 2nd platoon was getting pretty chewed up. But most of the German first platoon ended up in firefights with the Soviet first platoon, which had deployed behind the orchard, and the remnants of third platoon, who stayed in the fight despite their heavy casualties. The hand of Chip removes some German casualties. Because time was running out, we decided to see what a Human Wave looked like. So Chris pulled a couple of sections from his 2nd platoon, and charged the remaining section of Chip’s right platoon. The initial round of combat was inconclusive because of the distance that the Soviets had had to move, but the second round, predictably led to the Soviet weight of numbers and the German’s pinned status resulting in a Soviet win. Equally predictably the next card were the two German units closest to the melee, and the Soviet squads were cut down. If we’d had more time, that charge wouldn’t have happened, and I think we would have seen the Germans rolled up, if they didn’t withdraw. It was great fun to play IABSM again. I realised this was actually the first game of IABSM I’ve ever played at my place, and the second one involving my figures. I definitely need to do this more often!